ILCAA occasionally holds special exhibitions for the general public, to display the Institute's collection of rare materials on the languages and cultures of Asia and Africa, and also the results of research about such materials. Islam has a large presence in North Africa and in numerous regions in sub-Saharan Africa. It is also widely practiced in the eastern and western regions of　Ethiopia,situated in the northeast of sub-Saharan Africa and famous for　its ancient Christianity. The Kingdom of Jimma, founded by the Oromo in　the early 19th century, played an important role in the Islamization in　western Ethiopia. ILCAA has obtained an Islamic prayer book which J.Borelli, a French explorer who visited Jimma region in the latter half　of the 1880s, brought back　from the kingdom. 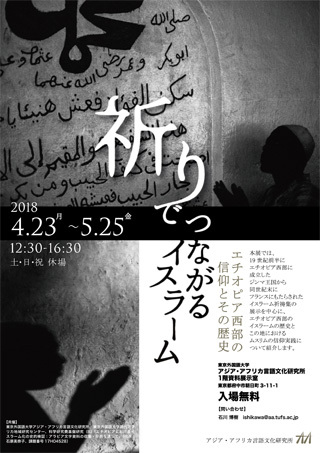 This exhibition focuses on　the history of Islamization in western　Ethiopia and religious life of　Muslims in this region by exhibiting the above　mentioned Islamic prayer　book and other valuable books, explanation panels,photos, and movies.